Narrative:Early this morning at 12:10 AM, October 30, 2012 the Spokane Fire Department responded to, The Wedgewood Park Apartments located at 202 East Wedgewood on a reported structure fire. Responding fire crews reported heavy smoke showing from a block away and upon arrival reported that they had a 3-story wood framed apartment building with fire showing from a ground floor apartment. Fire fighters aggressively attacked the fire from the front door of the apartment while additional fire crews completed search and rescue, ventilation and salvage and overhaul. Additional fire crews were called in due to the serious life hazard of an early morning fire in this apartment building that consists of 8-apartments in one building and 8 apartments in an adjoining building, connected by common walk ways. The fire was brought under control within 1 hour and fire crews were on scene throughout the night to complete the salvage and overhaul process. Six Engine companies, Two Ladders, a heavy rescue truck and 2 Battalion Chiefs were on scene during the initial operations of this incident. There were no reported injures to civilians or firefighters. The Red Cross arrived on scene to assist the occupants of the building that may have been displaced for the night. 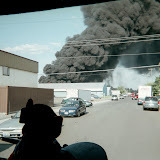 The Spokane Police Department was also on scene and provided traffic control and scene security during the operational period of this incident. Cause:The cause of the fire is under investigation by the Spokane Fire Departments Special Investigation Unit. Damage:The apartment of origin on the main floor sustained significant fire damage with smoke damage to the 2 apartment units directly above.